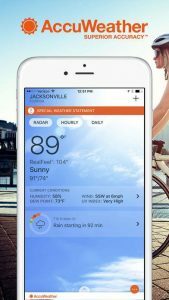 This free, award-winning weather app features AccuWeather MinuteCast®, the leading minute-by-minute precipitation forecast, hyper-localized to your exact street address. AccuWeather offers the same Superior Accuracy™ and great experience across all iOS devices, including Apple Watch™. AccuWeather MinuteCast® – minute-by-minute precipitation forecasts for the next two hours hyper-localized to your exact street address or GPS location. Available for the contiguous United States, Canada, Sweden, Denmark, United Kingdom, Ireland, Japan, France, Spain, Germany, Belgium, Switzerland, Netherlands, Luxembourg, and a growing list of global locations. Apple Watch Support – featuring AccuWeather MinuteCast, current conditions details, and severe weather alerts. When there is a severe weather alert for your favorite location, you will be notified by a tap sensation from the Watch and a low audible sound. Current conditions details include location, temperature and high and low for the day, wind speed, times for sunrise or sunset, and RealFeel Temperature® – AccuWeather’s exclusive forecast that shows the user how the temperature actually feels outside. AccUcast™ – Become part of the forecast by sharing your weather observations to help people in your community stay safe from hazardous weather and road conditions. View the real-time crowdsourced map with weather conditions submitted by users all over the world in a global animation display. Option to automatically download the app to all of your iOS devices. Widget available so you can see a summary of what you can expect from the day’s weather on your Today screen in the Notification Center, includes AccuWeather MinuteCast. Pushed severe weather alerts to keep you out of the storm. Immediately descriptive weather animations illustrating the current weather conditions. Animated weather radar and maps for tracking the storm’s path. Weather radar available in the United States, Canada, European locations including United Kingdom, Ireland, Germany, France, Spain, Germany, as well as Japan and Korea. Forecasting for all your favorite locations – every location on Earth. Your Daily Snapshot including MinuteCast® shown front-and-center when you open the app – a summary of what you can expect from the day’s weather. The Local Forecast Summary, a brief summary of what you can expect from the weather over the next 3-5 days for your location. Customizable current weather conditions detail – hide the details that you don’t care about. App doesn’t update data even when pulling down the screen. Love the app, but frustrating with old information. Updated (2Apr17): latest update caused the app to stop working on iOS both on iPhone and iPad. Also agree with other comment about limiting to 7 days forecast. I travel by RV and long range forecasting is important to my plans. Update (25 Apr 17): iOS and app updates much better. Would like to see Sunrise and sunset times added, other than in the hourly slide.